Well, That esculated quickly..snow totals going UP!! OK, Party people in the house! Who wants more snow?? Look at the bright side-- even if we get 8 inches, You will be driving tomorrow afternoon. March Sun is burtal, same angle as Late September. I am going to beef up totals a bit, and even say- some places, Lynchburg especially I would not be shocked if we had 2 inches total or even 8 or 9. Why? We have a strong contrast between warm and cold. 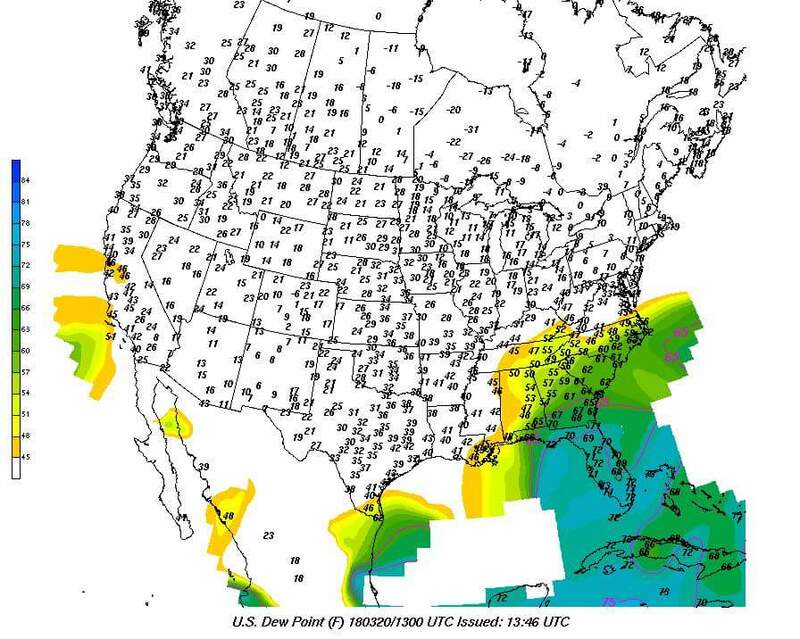 Look at these dewpoint temps 8 over southern PA and 65 in North Carolina. In simple terms, the cold air push is a bit stronger and the low is being forced further south. This should keep us in heavier snow longer and timed well. The snow last week- if you noted we hit 4.5-5 and stopped getting deeper when the snow slowed down. The best snows should fall overnight into mid morning but snows may linger a bit longer. If we were in January, We'd be talking about MAYBE a foot or more. The snow will start in impressive fashion: all the models show some type of heavy band that fires up over NW North Carolina and explodes north and northeast. Any rain will quickly change to sleet and snow, then snow. After that first crushing band of snow, we should see 5-6- more hours of moderate accumulating snow. By midmorning, it will keep snowing but hard to make snow depths greater. 1. The band misses your house. Very possible, greatest changes east regions (Danville, LYH area. 3. Sleet- greatest risk eastern regions. 4. It may "snow" 8 inches, but only accumulate 4. March-- it will lay, but not the usual ratios. My map has ranges. I may be underdone southside. Lynchburg: I have this theory about West to east moving upper air lows vs Southwest to north east. We usually do better than Roanoke in East west, and they do better in Southwes to north east. Last week, Southwest to north east- we had .15 more liquid and an inch more snow. (Feb 12, March 13 Jan 10 as other examples) We will put this to the test. Model data has slowly moved heavier snow into Lynchburg. Why? My theory is the low level jet comes in better with the east locations and the "bands" I often mention are more mature on West East moving upper air lows vs SW to NE bands tend to dry slot Lynchburg in a relative sense. This is another test of that theory. Share me with your friends and follow me on Twitter/Facebook at VirginiaWx. Will Tweet/post current obs, radar shots and other forecasting ideas about this event. Get this: MAYBE more snow Saturday!! Details on Late Season Winter Storm for Lynchurg, Roanoke, Danville and Blacksburg Areas..
Late blogging, simply put-- I was a doubter of this storm. In my interchat and responses, a later storm was better. First, night time was better for snow and more importantly We'd get a stronger coastal low. Well, we have a storm that is 12 hours later than thought and a decently strong coastal low. Winter Storm Waches Roanoke Valley south down 81. Expect: Watches and Warnings All of 81 and likely 460 to Appomattox. Expect: Advisories, maybe watches and warnings along southside from Martinsville to South Boston. Everyone along 81, except the actual Roanoke Valley (Orange Ave, Peters Creek, ect) 4 to 8, with some 10-12 inch totals possible in Floyd, Bent Mountain, ect. Roanoke City, valley level only east on 460 to Bedford, Forest, Lynchburg to Appomattox 3-6, possible 8 spots here and there. 1. May start as a mix or rain, but will change to snow. 2. Start time: 10pm Sunday far west, 2 am far east. 3. End time noon Far west Monday, 3pm far east. 4. More accumulations on colder surfaces and grass. 5. Low ratio snow- normal is 11-1 or so, this will be as low as 6-1 to maybe 9-1 in mountain west. Low is weaker, further away. Quicker mositure jump to coastal could rob central areas like Lynchburg. A bit colder, a bit faster a bit stronger. I love it when my readers share pics, amounts and start/stop times.